Una Elizabeth Dwyer née Sneyd (1900-1982), first cousin twice removed of my husband Greg, was the daughter of Samuel Charles Sneyd (1863-1938) and Emily Sneyd née Way (1868-1952). Usually in my family work I am able to find a considerable quantity and variety of information about the person I’m looking researching. I gain, I hope, some small insight into their circumstances and perhaps one or two events of their lives. Una Sneyd and her family, however, managed to keep a very low profile. They didn’t write to the paper with bright ideas about burials in wicker baskets, weren’t imprisoned for bankruptcy, and weren’t exiled for their religious views. Thoreau said that the mass of men lead lives of quiet desperation; the Sneyds apparently just led quiet lives, and left few traces of themselves for a family historian to work with. Una’s mother Emily was the seventh of ten children of John Way and Sarah Way née Daw. She was born in Grenfell, New South Wales in 1868 but her family moved to Parkes, New South Wales, when she was about five years old. In 1892 Emily married Samuel Charles Sneyd, a police constable, in Hughenden, Queensland. I don’t know why Emily, then aged 24, was in Queensland; Hughenden is two thousand kilometres north of Parkes. As far as I know, no other members of her family were in Hughenden. At the time of her marriage Emily was living at Hughenden. Lionel was born in Hughendon but the others were born in the Emmaville district of north-east of New South Wales. Samuel Charles Sneyd worked as a miner. When Emily’s father John Way died in 1911, four daughters were mentioned in his obituary, so it would seem Emily was still in touch with her family. When her sister Mary Ann Waine died in 1938, Mary Ann’s obituary mentioned only one sister, Eliza: the family seemed to have lost touch with Emily. Lionel served overseas in France, was wounded in action in July 1916, and was repatriated with a fractured left ankle. Only limited number of electoral rolls for New South Wales have been digitised. In these I have been able to find Una Elizabeth Sneyd listed in 1930 as living at 39 Tupper Street, Marrickville. Her occupation was shop assistant. She was living with her parents and younger brother Jasper, who was also a shop assistant. Samuel was a carpenter. Emily’s occupation was listed as home duties. In 1932 Una Sneyd married Patrick George Dwyer, an engine driver. In 1935 the Dwyers were living at 11 Audley Street, Petersham. Una’s occupation was given as home duties. Petersham is immediately north of Marrickville. By 1936 the Dwyers had moved to 6 Brightmore Street, Cremorne. The suburb of Cremorne is on the lower North Shore in Sydney, 13 kilometres north-east of Marrickville, across the harbour. The Dwyers were still at the same address at the time of the 1980 electoral roll. Samuel Charles Sneyd died in 1938 and Emily Sneyd died in 1952. I have not ordered her death certificate, but I notice from the index that Emily’s mother was named Ruth; her family appear to have known very little about Emily’s parents. Patrick and Una seem to have had only one child, called John. He is listed on the 1958 electoral roll as living with them and is named in their death notices. As the voting age was 21, he was born between 1936 and 1937. I have not found a newspaper birth notice. Patrick George (Paddy) Dwyer died 29 December 1981 in hospital. His death notice stated that he was from Cremorne, loved husband of Una. The notice names his son and two grandsons. Una died on 13 February 1982, also in hospital. Her death notice also named her late husband, son and two grandsons. In May 1982 there was a notice in the Sydney Morning Herald associated with the estate of Patrick George Dwyer, retired council employee. In researching Una I have been able to verify dates, places and relationships with the aid of birth, death and marriage indexes, electoral rolls and notices in the newspapers. The Sneyd and Dwyer families, however, did not attract much notice in the newspapers and it has been hard to find any events that enable me to get to know Una Dwyer née Sneyd. Seaman’s record for John Plowright (1831-1910), one of the many many sources I have used in compiling my family tree and associated family history. My main tree is kept on Ancestry.com, synchronised to Family Tree Maker 2017. 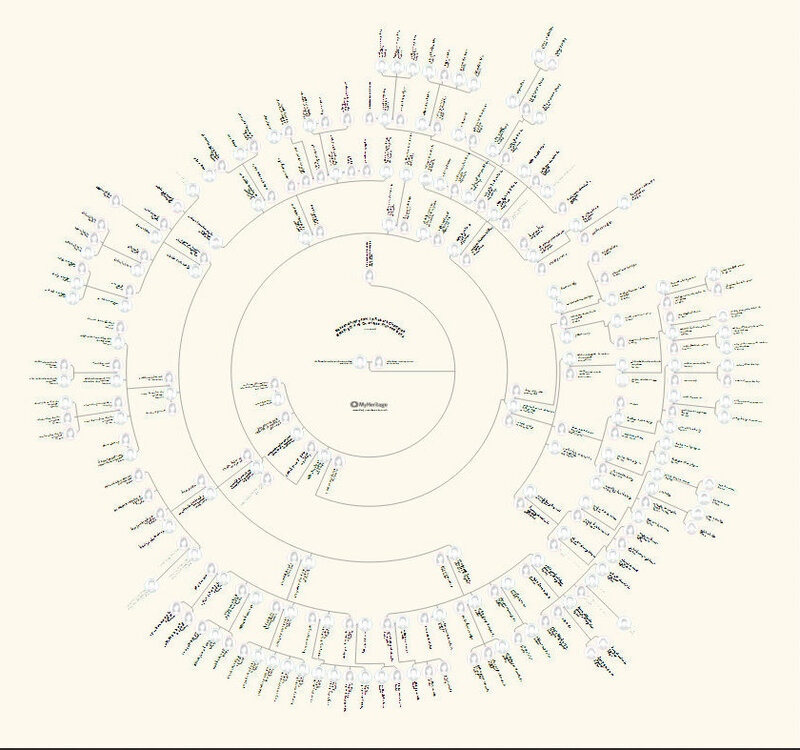 Family Tree Maker also has 7,484 people covering 23 generations. The youngest person is my husband’s great nephew born May 2016. The oldest forebears are William Mainwaring who died 1341 and his wife Mary Davenport, my 19th great grandparents. The discrepancy between Ancestry.com and Family Tree Maker in trying to reconcile records and sources can be accounted by not all records have media, and the same record can be cited for several people, for example a marriage record might mention husband, wife, and fathers of both bride and groom thus one record might be be a citation for 4 people; similarly one census record could be cited for many members of a family in the same household on census night. Under the Publish menu in Family Tree Maker there is a Source Usage Report. The report runs to 1,487 pages at present. One source can be cited for several facts and this report lists all the facts covered by the citation. Family Tree Maker can also produce a report of undocumented facts. For my extended family this report is 416 pages long. The report of documented facts is 3,282 pages long. There is room for improvement. At present I have 14,293 citations : 7,484 persons or 1.9 citations per person. Of all facts there are approximately 3,700 pages of which 416 pages are not documented or 11%. I was unable to identify a quick and effective way to answer Randy’s question as to which source have I used the most. Under the Sources menu in Family Tree Maker I could have a look at source groups and for each group see how often it had been cited. I found that Australian births were cited 744 times and the 1861 English census was cited 374 times but was unable to export the data and be systematic in my review. I know my sources need to be cleaned up and reviewed, there is plenty of room for improvement. I also find when revisiting my sources that I often learn something new by reviewing the detail within the record. Every Friday the genealogy website FindMyPast lists records newly added to its collection. On 1 September they added several volumes of English marriage licences. In the Commissary Court of Surrey Marriage Licences 1673-1770 I was pleased to find a record, dated 19 April 1765, which gives licence details for my 6th great aunt, Anne Champion Crespigny. Anne was the sixth of seven children of Philip Champion de Crespigny (1704-1765) and his wife Anne née Fonnereau (1704-1782). She was born 10 October 1739 and was baptised 30 October 1739 at the Church of St Benet’s, Paul’s Wharf, London. Anne’s father Philip died 11 February 1765. He had had a successful career as a lawyer including holding the position of Marshall of the Court of Admiralty. The Commissary Court of Surrey Marriage Licences lists Anne as a spinster of Camberwell, 21, licensed to marry Bonouvrier Glover of Camberwell, abode 4 weeks, Esq. signs, bachelor 21. Claud Crespigny, surrogate. (page 547). The index of licences says she was 21 but actually she was 26 and thus of full age, that is over 21. Bonouvrier was also 26. He had apparently only recently moved to Camberwell. In May 1784, after his uncle’s death, James Gladell changed his surname to Vernon. Anne died 2 June 1797. Anne had no children. James Gladell Vernon married again in 1802. He died in 1819. My mother, born in Berlin, now an Australian, still has a few German family documents, and for me these have been a valuable source of information about my German forebears, her side of the our family. However, most of what I know about about my German ancestors I learned directly from my German grandfather, who was happy to answer my family history questions. When I started researching this branch of the family I also found some good leads in the International Genealogical Index (I.G.I.) microform indexes prepared by the Church of Jesus Christ of Latter-day Saints. Researching German sources from Australia is difficult, of course, and there is much more information online about our British forebears. So I look forward to attending a day’s session in August about German genealogical resources and methods for Australian researchers, hosted by Unlock the Past. The main speaker will be Dirk Weissleder, a genealogy consultant, who is national chairman of the Deutsche Arbeitsgemeinschaft genealogischer Verbände e.V. (D.A.G.V.) (at http://www.dagv.org), the umbrella organisation of the genealogical and heraldic associations in Germany. He is President of the Federation of Family Associations (Bund der Familienverbände, BdF). Herr Wiessleder has written extensively about genealogical research in Germany. See, for example, http://www.forum-familiengeschichte.de/haus-der-genealogie-hdgen/. In Melbourne Herr Wiessleder will be speaking about primary and secondary resources on genealogy in German and about European research generally. He will also be talking about the International German Genealogical Partnership, https://iggpartner.org/about.php, and on archives, libraries and institutions for genealogical researchers in Germany. Herr Weissleder will speak in Melbourne on Saturday 19 August. The Roadshow costs $57 for a single day if the ticket is purchasedahead of time, or $60 on the day. On Friday 18 August, a Scottish researcher, Chris Paton, will be speaking on British Isles research. A combined ticket for the two days is $90. Herr Wiessleder will also be visiting Brisbane, Auckland, Sydney, Canberra, Adelaide and Perth. 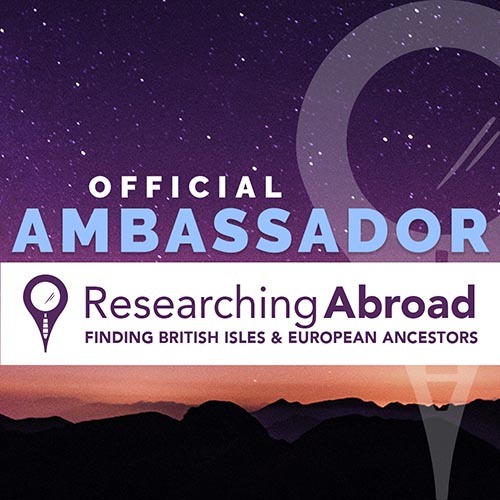 Disclosure: I have accepted the opportunity to participate in the Unlock the Past Researching Abroad Roadshow 2017 as a Roadshow Ambassadress and agreed to promote the Roadshow in return for free entry. I will write again after the session on what I have learned. I was interested to read about sun charts, a new product from MyHeritage for displaying family trees. 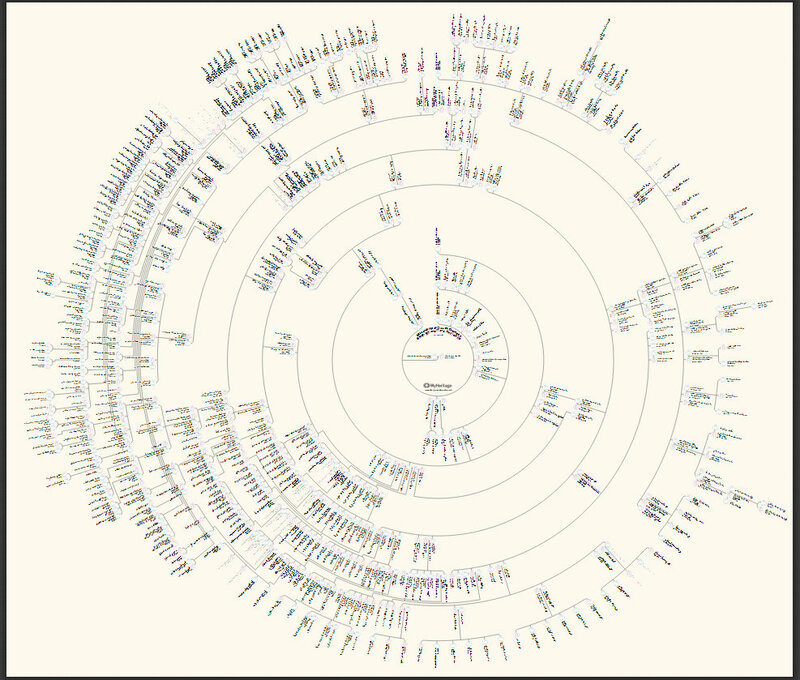 I have seen circular charts displayed at the Genealogical Society of Victoria and thought they looked very elegant, but they were hand drawn and it looked like a lot of work. 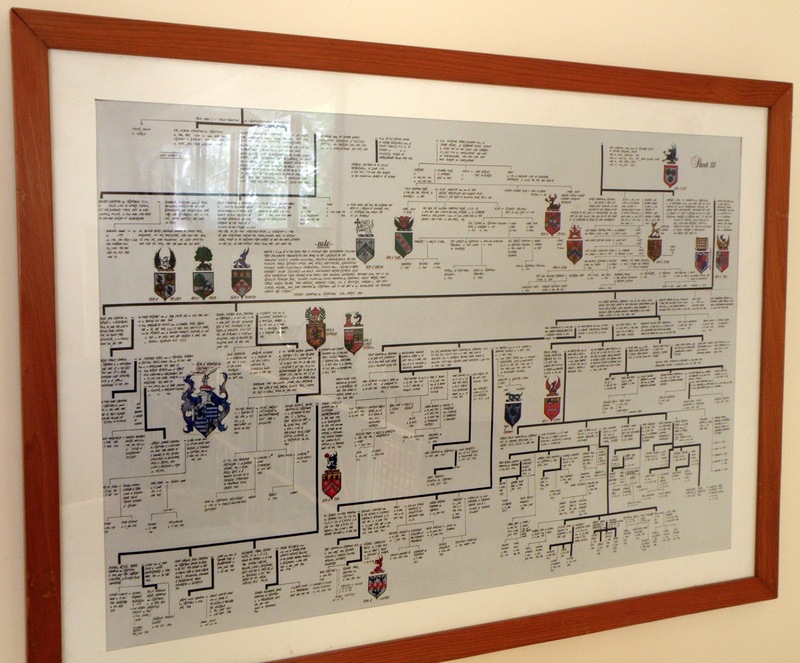 In the 1990s a cousin arranged for a de Crespigny family tree to be drawn up by hand. It is very elegant but clearly a lot of work, not only in compiling the research, but also in arranging the branches of the tree and all the descendants. This morning I signed up to MyHeritage and uploaded a gedcom. The process was easy and efficient. I have generated a couple of charts and I have had them printed up at OfficeWorks. It was only $4 per A0 sheet and I am very pleased with the results. The next step will be to add photographs to the tree at MyHeritage as I think this will make the charts more interesting. I haven’t got pictures for everyone but I have quite a few. This chart is of the descendants of Claude Champion de Crespigny (1620-1695) my eighth great grandfather. 12 generations are shown in the one chart. This chart is just of the Australian branch of the family, that is the descendants of Philip Robert Champion de Crespigny (1817-1889), my 3rd great grandfather. Greg’s grandfather Cecil Young (1898-1975) had a small collection of postcards that he had collected when young. He passed it on to Greg’s father, Peter. 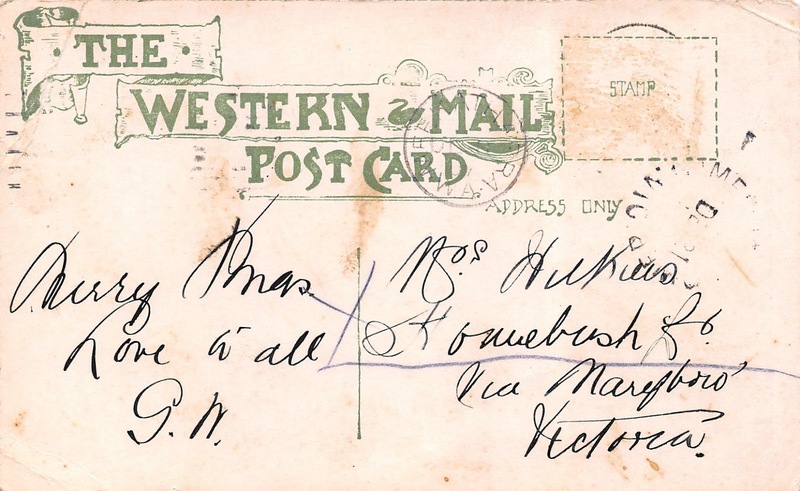 When I first started our family history research I looked at those postcards and tried to work out who was writing to whom and why the cards had been collected. They contained important clues. I’ve spent many years working on the family tree they make a lot more sense now, but they are still worth revisiting for new insights. 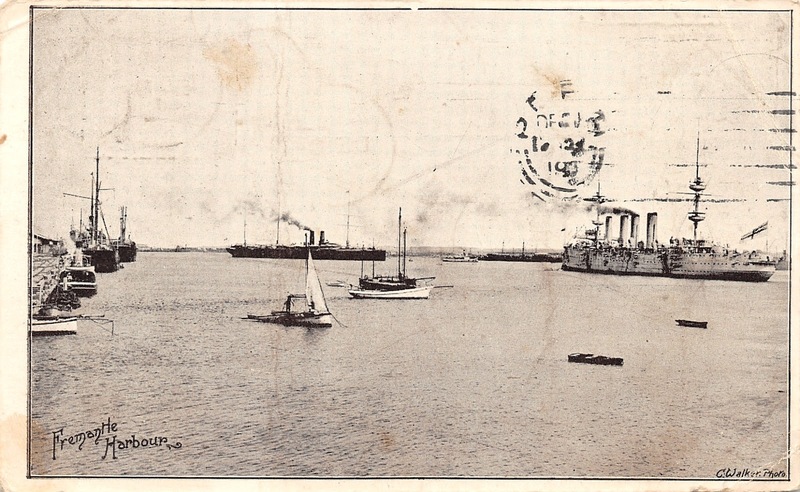 Two of the cards were sent from Western Australia, I think from Cecil’s cousin George Wilkins (1884-1909). 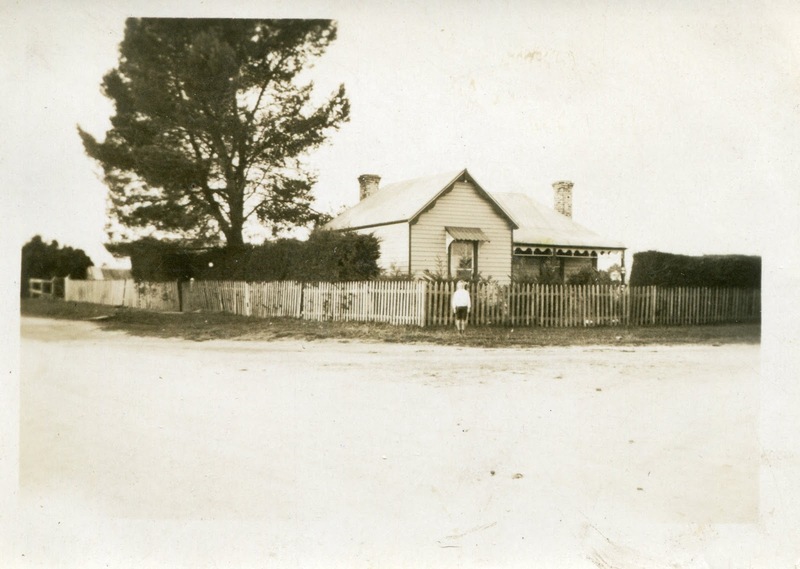 Cecil and his brother Jack lived at Homebush near Avoca, with George’s parents, George Wilkins senior (1857-1944) and their aunt Charlotte Wilkins née Young (1861-1925). 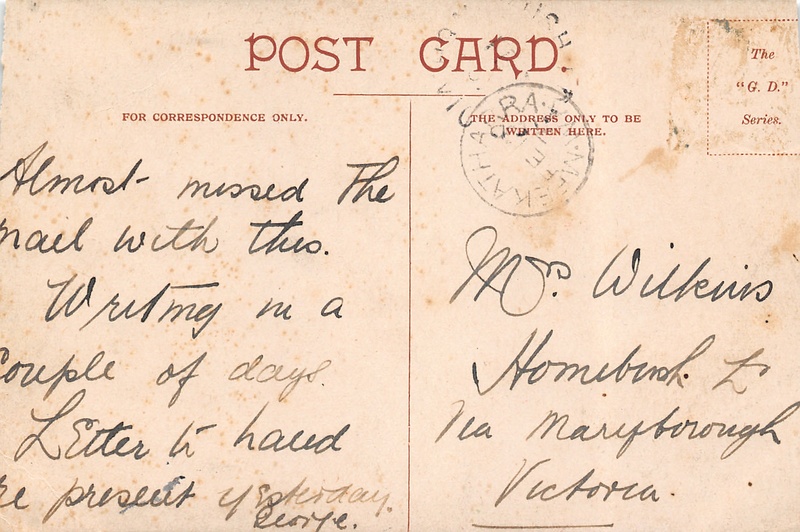 These two postcards were addressed to Charlotte Wilkins. The cards show Fremantle Harbour and Kings Park, Perth. Both cards are postmarked Meekatharra, a town in the mid-west of Western Australia. An article in the Avoca Free Press of 10 March 1909 mentioned a memorial service for George Wilkins who had died 30 January 1909 in Meekatharra. Cemetery records show that George was buried at Nannine Cemetery. Nannine is 35 kilometres south-west of Meekatharra, 735 kilometres north-north-east of Perth. It is now a ghost town but in the early 1900s it was a gold-mining centre. When I was thinking about researching this post I decided to look up the Victorian probate index. Although George did not die in Victoria there was a chance his affairs had been administered there. George died intestate but he had a block of land and there is a file containing letters of administration. 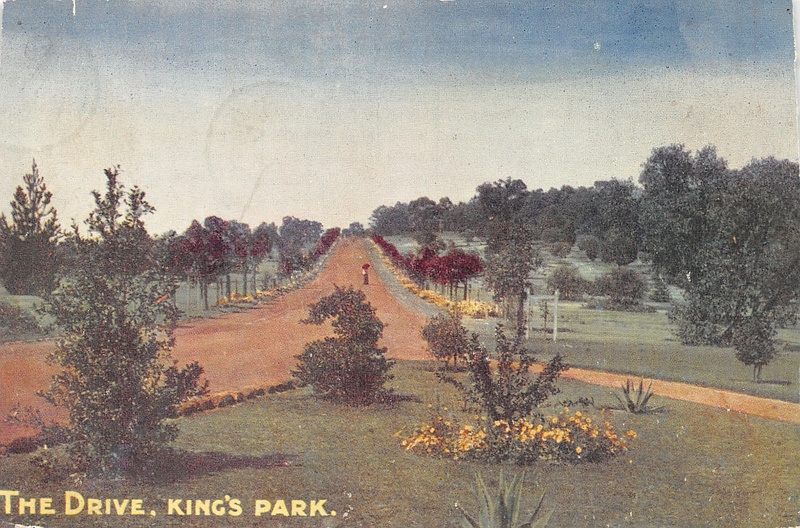 The letters of administration dealt with 20 acres of land at Homebush Lower and associated fencing. I don’t know how long George Wilkins had been in Western Australia. The postmarks are not clear and I can’t read the dates. One day I was browsing the resources of the Ballarat Archives Centre and came across some microfiche prepared by the Ballarat and District Genealogical Society, the Ballarat and District School Students Registers – Consolidated Index 1864-1963 (BDGS). I checked for my husband’s father. He was listed and I learned something that I hadn’t known. 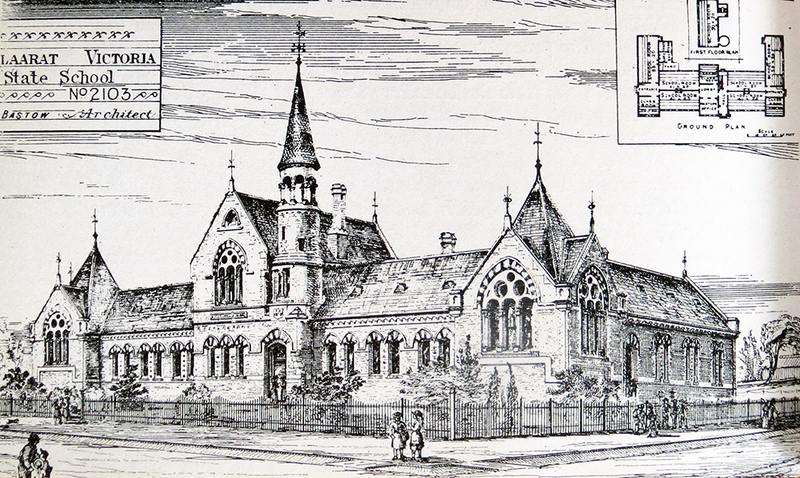 He had moved schools and addresses while living in Ballarat as a child. Ernest Young was born on 8 July 1920 in Melbourne to Elizabeth Young née Cross and Cecil Young. Ernest was always known as Peter. His parents separated and Peter and his mother lived with her parents, Frederick James Cross and Ann Jane née Plowright. 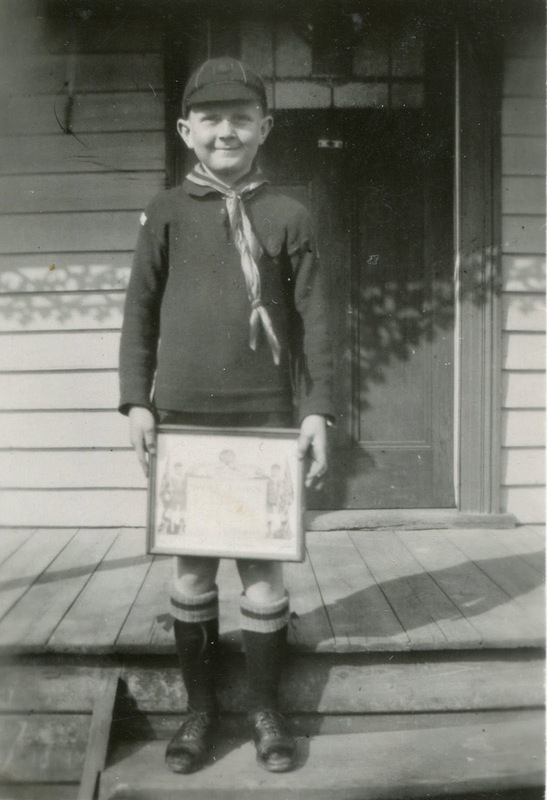 Peter Young aged about seven. The Cross family lived at Homebush near Avoca for many years. 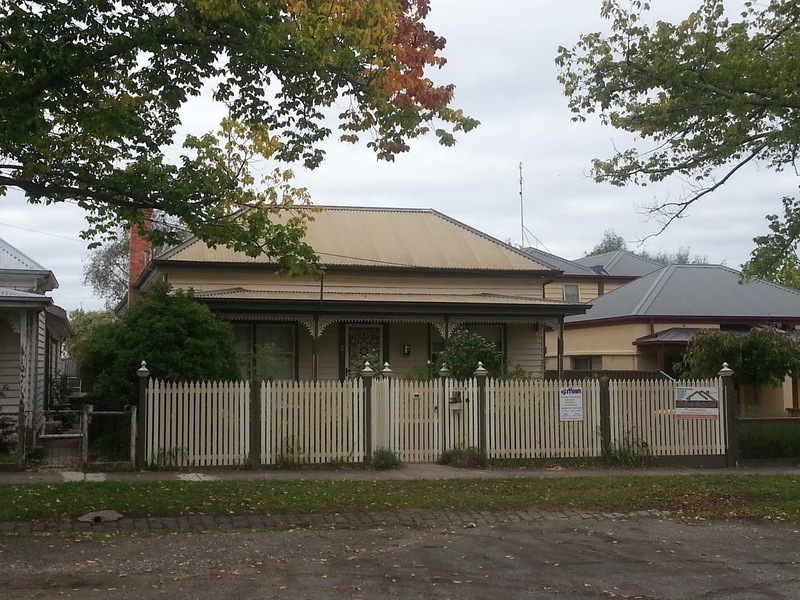 In the early 1920s Frederick James Cross sold his property there and the family moved to Sebastopol near Ballarat. They lived on the corner of Grant and Victoria Streets. The house is still there. Peter outside the Cross house on the corner of Grant and Victoria Streets, Sebastopol. 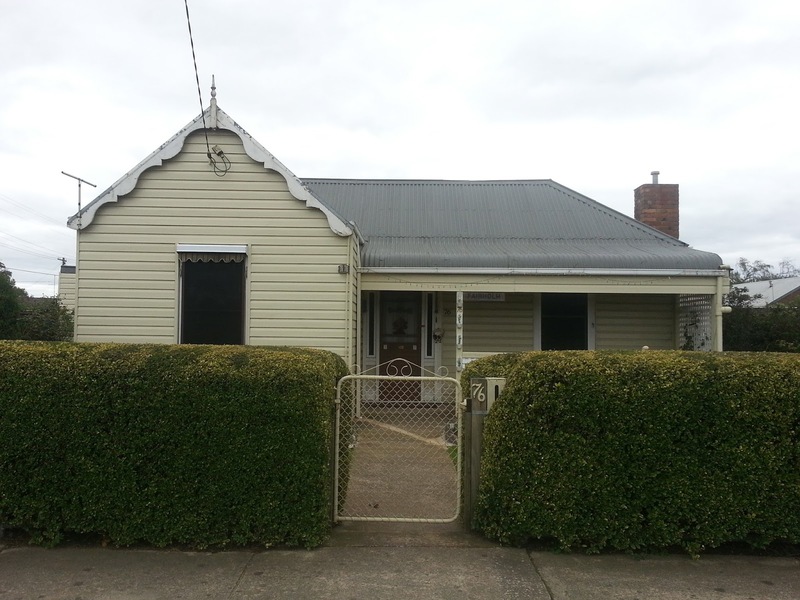 The house on the corner of Grant and Victoria Streets where Peter Young lived with his mother and grandparents. Photographed May 2014. The Sebastopol Primary School records are held by the Sebastopol & District Historical Society, housed in the old Sebastopol school building. The Society is open on the first Sunday of each month from 2 to 4 in the afternoon. 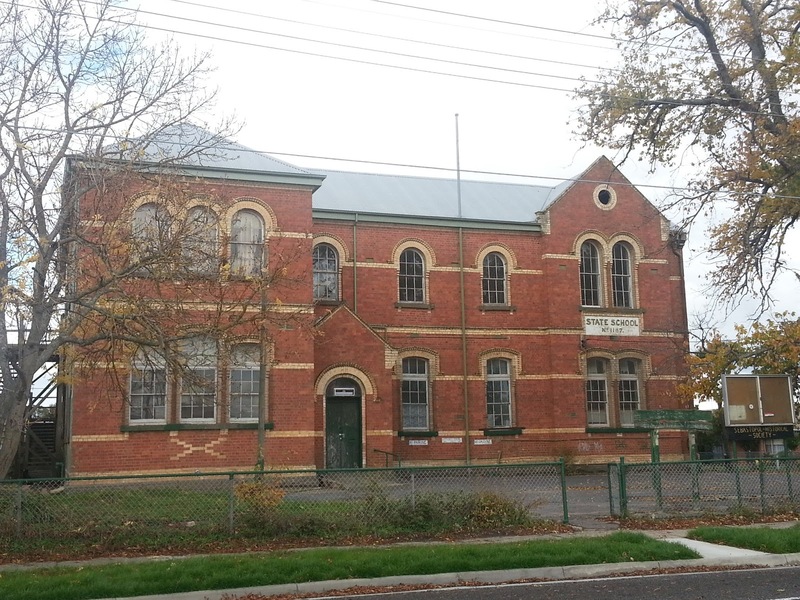 The old building of the Sebastopol State School now houses the Sebastopol & District Historical Society. Photographed May 2014. Ernest Young started school at Sebastopol on 3 June 1925, just over a month before his fifth birthday. His father, Cecil Young, was named as his parent. Cecil’s occupation was given as labourer. 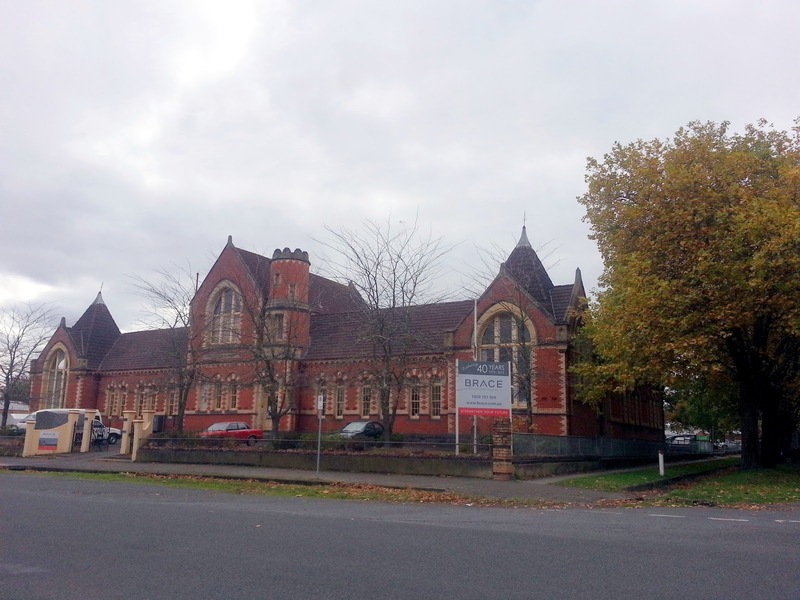 The school records show that Peter left Sebastopol to attend Urquart Street school in Ballarat in December 1929. Peter’s grandfather Frederick James Cross had died in May 1929 and the family moved house. The Urquart Street School records indicate that he was living at 419 Ascot Street and that he left in December 1931 to go to Melbourne. Peter’s grandmother died in November 1930. It seems that another upheaval in his living arrangements followed. I don’t know where Peter went to school in Melbourne. His mother found work as a housekeeper there. 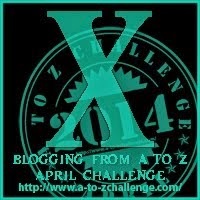 In 2012 at http://www.lonetester.com/2012/10/family-history-through-the-alphabet-challenge-x-is-for-signatures/ Alona Tester blogged about ‘X is for signatures’. She included examples of certificates where ‘X his mark’ showed that someone could not sign his name. I looked though my collection of birth, death and marriage certificates for examples of people who could not sign their name. 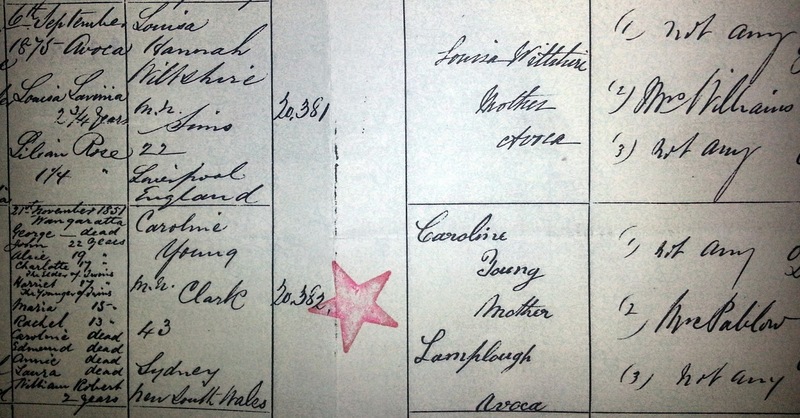 On the birth certificate of Alice Young, born in 1859, the informant, her mother Caroline née Clark, could not sign her name and made an X. 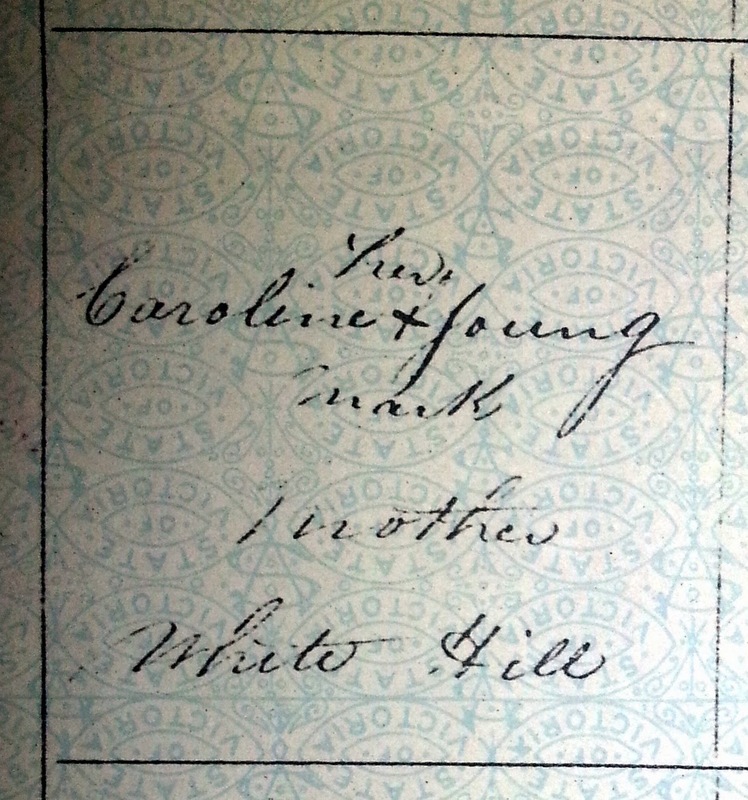 On the birth certificate of Caroline Young in 1867, the informant was her father George Young. He signed his name. In 1878 the birth of James Ernest Young was registered and the informant was Caroline. This time she appears to have signed her name. The informant’s name is in a different handwriting to the details on the rest of the certificate. Perhaps Caroline had learned how to sign her name in the twenty years between the births of Alice and James. Informant’s details from the birth certificate of Alice Young. Birth registered in Victoria number 4807 of 1859. Caroline was also the informant on John Young’s birth in 1856. She signed with her mark on that certificate too. Informant’s details from the birth certificate of James Ernest Young. Birth registered in Victoria number 20382 of 1878. Other details from the certificate and from the preceding certificate have been left to show the difference in handwriting, which suggests that this might be the signature of Caroline. Sarah Way née Daw was the informant on the 1868 birth certificate of her daughter Emily Way. She could not sign her name and made a mark. However, in 1896 Sarah’s husband John Way signed his name as the informant for the registration of the death of his son John. When she registered the birth in 1864 of Henry Dawson at Corby, Lincolnshire, Eliza Dawson née Skerritt, his mother, could not sign her name. Her husband Isaac was able to sign his name when they married in 1855. She signed the marriage register with her mark. These are the only examples I could find in my family documents of people who could not write their own name. All three women were great great great grandmothers of my husband. Eleven of his other great great great grandparents could sign their name. These women were all born in the first half of the nineteenth century. All their husbands could sign their own names. In the next generation, their children, both girls and boys, could write their own name. Some demographers have argued that illiteracy is linked to the size of families, in particular that education diminishes fertility. For example, a study of demographic changes in Britain from the 1850s to the early twentieth century found that “the extension of basic literacy is related to increases in female labour market participation, which is in turn related to fertility reduction”. (Newell and Gazeley) The data from my family does not support this hypothesis. None of the women in the table below were ever in paid employment. I cannot see any link between the literacy of my own and my husband’s great great great grandparents and the size of their families. Caroline Clarke 33 no 13 18 18 43 44 1835-1879 Includes one set of twins. Eliza Skerrit 45 no 10 21 24 38 65 1834-1899 Includes one set of triplets. This is the only English family. The last child was born at the time Eliza’s husband, Isaac Dawson, died. The women in this table were Australian, with the exception of that of Eliza Skerrit, wife of Isaac Dawson, who was from Lincolnshire, England. I have not included my German great great great grandparents as I do not have the relevant data.